An innovation in hair protection. 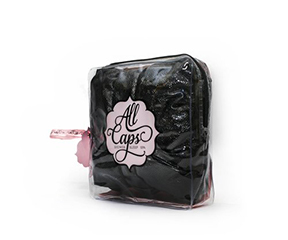 All Caps are hypoallergenic, fungal-resistant, adjustable, sustainable, reversible for masking, machine washable, come with a reusable travel case, and made in the USA. Longer and fuller, this cap is perfect for hair with volume, extra length or extensions. Slightly smaller, with a single sided adjustment, pick one (or all) in the color that inspires you. All colors are limited editions. Shipping is on us xoxo. 20% of every All Caps sold in the US will benefit victims of human trafficking and sexual exploitation through our partnership with Blue Heart International. Please help us raise awareness by taking a photo in your cap, with the included blue heart sticker on your hand, and tag @blueheartinternational @allcapshair #capthetrack Be the voice for countless victims.